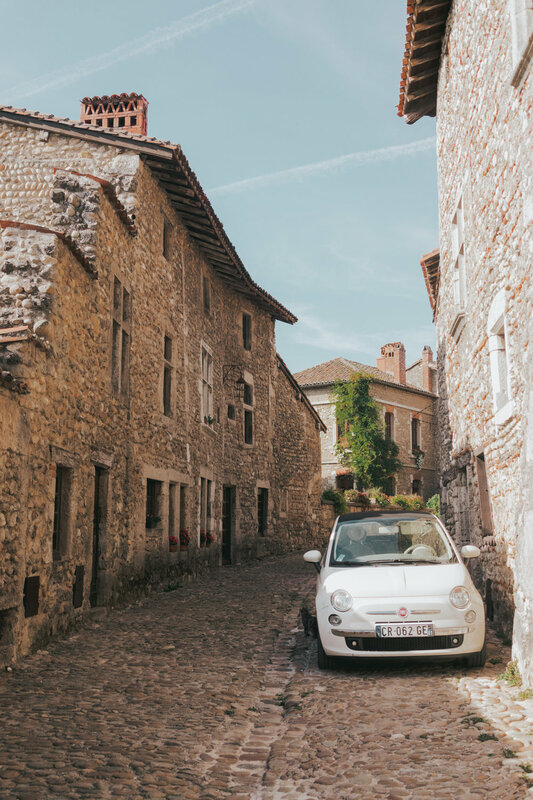 With a few extra days in Lyon – after deciding to postpone our trip to Provence – my boyfriend decided to take me on a day trip to Perouges, Which is only half an hour away from Lyon by car. The perfect day trip from Lyon! The picturesque and peaceful village is one the most authentic – although restored in the early 1900’s – medieval towns you will ever see. The cobblestones roads, half-timbered stone houses, and even the recipe of their world famous Galette de Perouges remains intact in this place. After the short drive and a ten-minute walk uphill – worth it – we finally arrived at the city’s gate. We made a quick stop at the tourist office, which is located right outside the entrance, and we headed in. Perouges is not only well-preserved structurally, but it’s also unspoiled with souvenir shops and tourist traps. The locals have worked arduously to conserve the authenticity of its medieval time – of course sans famine and plague. And unlike other popular –touristy- places, the locals inhabit the town. As you explore it, you will see the residents walking around, working, or taking their pet for a walk. For a famous tourist town, the medieval city felt very calm. It is indeed a great place to spend half a day or a day strolling its historical alleyways. We arrived around 10 am, spent the morning walking around, and then settled for delicious lunch at Le Relais de la Tour – on their front patio overlooking the plaza. Afterward, we continued our tour for a couple more hours. For a list of restaurants in Perouge check out this list. You must try Perouges’ famous sugary and buttery Galette de Perouges! Created by Marie Louise Thibaut in 1912, the treat has been a staple ever since. The Galette de Perouges is a brioche dough flatten and baked with butter and sugar on top for a caramelized and crispy texture. Another traditional dish you must try is the Pérougeoise – perfectly gratinated potatoes with mustard cream, Bleu de Bresse cheese, and a mouthwatering roasted chicken on top. The liveliest time to journey on a day trip to Perouges is during their busy season: April – October or December for the Christmas market. 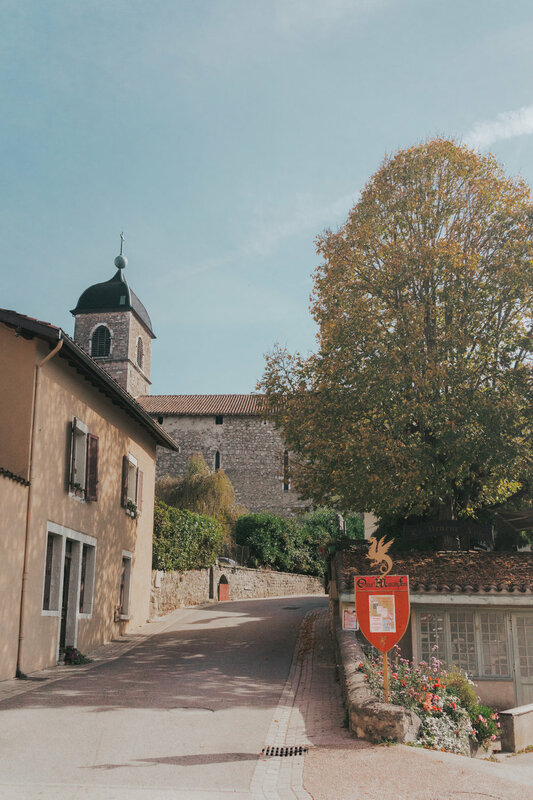 If you visit during their low season, you may find the town a bit too empty – unless that’s what you are looking for – and many of the stores, restaurants, and even the tourist office closed. If you visit Perouges in April, on Wednesday’s, you will find most shops closed. Perouges is only 30 minutes away from Lyon, so a short drive on the A42 and you are there. There’s a designated visitors parking lot outside the gated town for 2 Euros. The earliest train departs from Lyon to at Meximieux—Pérouges at 6:30 am, and the last train from Meximieux—Pérouges back to Lyon departs at 9:00 pm. Check the schedule so you can plan accordingly. The train station is 20 minutes away walking distance to the gated town. Wear comfortable shoes, as the steep cobblestone roads require good walking shoes. Are you planning or would like to visit Perouges? Pin it!